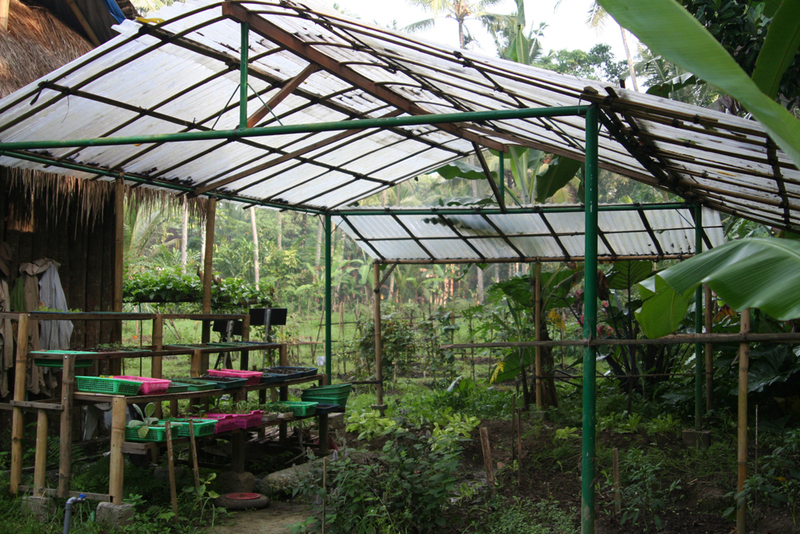 The permaculture garden at Jiwa Damai features a plant nursery. This area is sheltered by a roof to protect the seeds from the heavy tropical rains. One challenge we have is to raise the little seeds, grow them into small plants, that can then be planted into the grounds. The ideal thing would be to grow the seeds in biodegradable pots. On Bali, unfortunately there are no biodegradable pots available. So once more we had to be inventive and develop our own devices: We use cut banana leaves, which are folded into the shape of a pot. This technique is working very well. The seeds develop beautifully. Once big enough they are planted in the organic garden. My name is Ketut and I am the head gardener here at Jiwa Damai. I am responsible for the huge organic permaculture garden with all the variety of tropical flowers, plants and trees. Today I want to show you my nursery, where we grow the small plants out of seeds. Once the plants are well nurtured and big enough, we put them out in the open field. The nursery has a roof, to shelter the small plants from the heavy rains. Without a roof they would regularly be destroyed by the down-pouring rains. We organize guided tours through the extensive organic permaculture garden - stop by and have a look for yourself. See you soon at Jiwa Damai !